Welcome to the reviews and previews section on International Hero. I've been asked several times by people writing in to me about what books, comics and DVDs I'd recommend checking out. I'm not sure why anyone thinks my opinion is more valid or interesting than anyone else's, but since people have persisted in asking, I previously put together a semi-regular reviews section where I covered the occasional new release that takes my fancy. I've now cleared the old reviews out as they were long out of date, and have just started adding recommendationa again (no actual reviews yet, but that should change once I have time). If you are a creator or publisher wanting your product publicised and/or reviewed, then please feel free to drop me a line. While my site's focus is largely aimed at superhero features, I am more than happy to review any comics regardless of genre, and movies or TV shows with action, SF, fantasy, spies or detective show backgrounds. As ever, comments below are my opinion only, and your feelings may differ stuff about the stuff I like or dislike. Some of these are recent releases, others older stuff I feel deserves a bigger spotlight, but all should in theory still be in print and readily available. In the grim backstreets of Whitechapel, a killer known as Silver Knife is cutting down vampire girls. The eternally young vampire Geneviere Dieudonne and Charles Beauregard of the Diogenes Club are drawn together as they both hunt the sadistic killer, bringing them ever closer to Englands most bloodthirsty ruler yet. 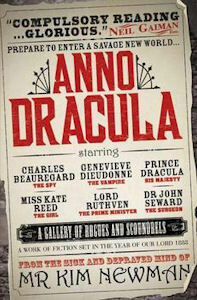 Anno Dracula's actually been out for a few decades now, but that doesn't make it any less worthy of a recommendation. Kim Newman poses the question "what would have happened if Van Helsing's hunters failed to stop Dracula?" The answer is that Queen Victoria became his third undead bride, and Britain opened its doors to the world's vampires. Now the Jack the Ripper murders are being carried out in a vampire-run Britain populated by famous fictional vampires from books, films and television living side by side with the heroes and villains of Victorian-era literature. If you like League of Extraordinary Gentlemen and its use of cameos of characters from popular fiction, then this is the vampire equivalent, but that might even be selling it short. 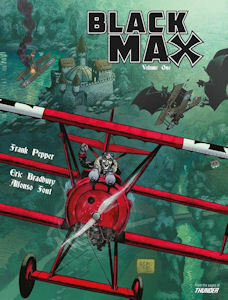 Anno Dracula is the first in what has become a series of stories set in this world, each jumping forward in time to cast the vampiric mirror on real world events - for instance, book two is the First World War tale The Bloody Red Baron, which deals with Baron von Richthoffen's undead air squadron battling their vampire RAF counterparts. The entire series is well worth checking out. On the eve of Draculas Jubilee, radical forces gather to oppose the tyrant. Kate Reed, vampire journalist and free-thinker, takes a seat on the revolutionary Council of Seven Days, though she learns that the anarchist group harbours a traitor in its midst. The Grey Men, Draculas dreaded secret police, have been ordered to quash all resistance to the rule of the arch-vampire. 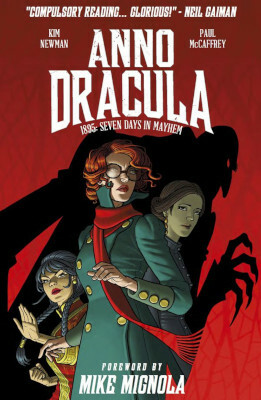 Anno Dracula ventures from prose novel into comic book territory with a tale set between the first and second novels. Written like the novels by Kim Newman, it is a joy to behold. 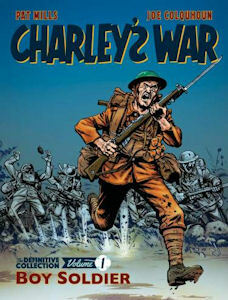 Considered by many as the most important war story to appear in comics, Charleys War follows the working class Charley Bourne who eagerly signs up to fight on the Western front in 1916. The idealistic sixteen-year-old experiences a hellish world of trench warfare where every day is a bitter fight for survival. Charley and his friends soon realise they have been thrust into a conflict where ordinary people are expected to throw away their lives to serve the selfish interests of those in power! I've only put up the cover for the first of Rebellion's three new Charley's Wars collections, but the two forthcoming volumes are also worth snatching up as soon as they become available. How good is Charley's War? Well, apart from the not unwarranted description identifying it as the most important war story to appear in comics, it's so good that I intend to pick up all three volumes despite already having the Titan collections that came out a few years ago. 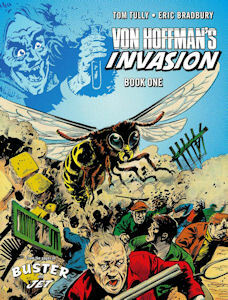 With so many comics on my wishlist, I normally wouldn't double dip and buy a story I already have again just because it's in a new collection, but Rebellion are doing it right, reprinting the pages that were originally in colour in colour (unlike Titan), and that alone is worth it to me. A six issue series of comics collecting the classic COMBAT COLIN strips that appeared in Marvel UK's ACTION FORCE and TRANSFORMERS comics in the late Eighties / early Nineties. You'll see the very first Combat Colin strips and its evolution into a full page serialised strip, with him (and his faithful assistant Semi-Automatic Steve) encountering their first villains Doctor Nasty and Aunt Arctic of the Antarctic! Adventures that take our heroes from the suburban back garden to Egypt and beyond. 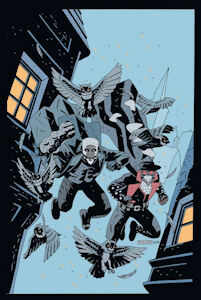 Again, I've only put up the first cover, but the second issue is also out, and four more should be coming soon. 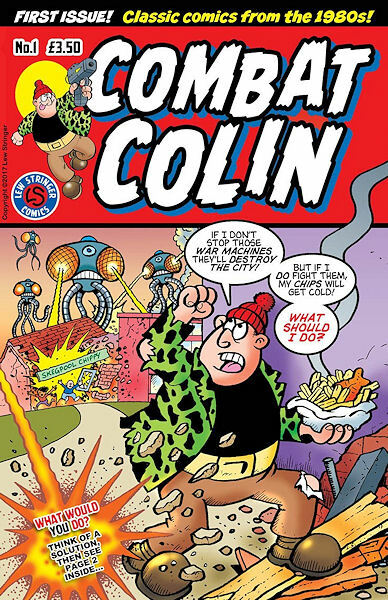 Lew Stringer's got some other excellent titles worth picking up, such as Brickman and Derek the Troll, but Combat Colin remains one of his most enjoyable characters, and this new series promises to finally collect his entire old run of appearances that are otherwise scattered across dozens of comics, making them pricey to track down. MEET BRITAINS GREATEST GURNING GROTESQUE! 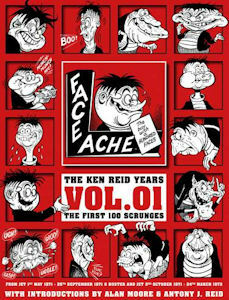 Ken Reid is consistently name-checked by the greats of comics  from Alan Moore to Kevin ONeill, John Wagner to Pat Mills  for his unique art that is matched only by his enduring sense of humour. In a hardcover edition befitting his status as one of the all-too-forgotten greats of British comics, we present his timeless Faceache  the humorous adventures of Ricky Rubberneck, the boy with a bendable bonce whose skin stretches like rubber. At will, he can scrunge his face into anything, whether its mimicing others or turning into monstrous creatures  but always coming a cropper! 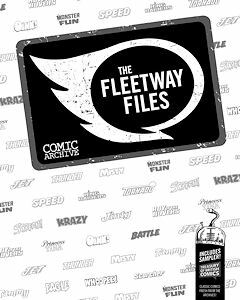 Rebellion's purchase of the Fleetway back catalogue in 2016 was exciting news, and the subsequent launch of their Treasury of British Comics has released a surprising mix of gems, all of which are worth considering purchasing. But given the nature of my interests, which naturally mirror what I cover on this site, it's no surprise that one of the highlights for me has been Faceache. Hilarious stuff, well worth adding to your bookshelves. Hibernia Comic's most ambitious project, a 100 page plus archive of British comic content looking at IPC's output from 1969 onwards. Their previous archives (no longer readily available, sadly) were all excellent, so this should be one to check out when it comes out in May 2018. Their volume on Scream!, titled It's Ghastly, even included stories commissioned for Scream! that were left unpublished due to the titles' abrupt cancellation, so I'm excited to see what The Fleetway Files has uncovered. In the middle of a gang war, wanted for murder, truly alone and outside the law, Detective Inspector LeBrock is on the run from both the police and gangster assassins, the victim of a diabolical scheme to annihilate himself and everyone he holds dear, engineered by mastermind crime lord Tiberius Koenig, one of the most despicable villains in the history of detective fiction. 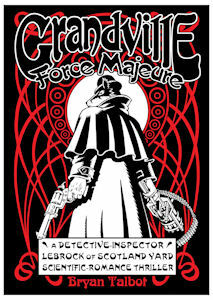 A fiendishly ingenious story of love, tenacity, treachery and tragedy, this fifth, final and longest stand-alone volume of the Eisner and Hugo Award-nominated Grandville series by master storyteller and graphic novel pioneer Bryan Talbot is a veritable rollercoaster of a detective thriller, featuring Grandvilles trademark high-octane excitement, humour and deduction on a Holmesian scale as we finally meet LeBrocks mentor, Stamford Hawksmoor, and discover LeBrocks untold backstory. Fan-favourite characters Detective Sergeant Roderick Ratzi and LeBrocks vivacious fiancée, Parisian prostitute Billie are joined by a new badger in town! Enter Tasso, an Italian badger whos bigger, meaner and uglier than LeBrock  but is he a force for good or evil? A battle royale ensues as LeBrock fights against truly outrageous odds. How can he possibly survive? I've only pictured the latest and last of the Grandville series, but the whole run of Bryan Talbot's anthropomorphic steampunk detective series is a joy. The artwork is sumptuous, the writing tight, and the sneaky cameos and art references hidden throughout the stories are a delight to uncover. After being scratched by a radioactive leopard, young Billy Farmer soon discovered that he had acquired the strength, agility and senses of the mighty jungle cat. Creating a costume to disguise his identity, Billy became the masked vigilante known as the Leopard-Man  Selbridges premier crime ?ghter. Living with his aunt and mean uncle in a small house on Lime Street, Billy juggles his time between schoolwork and saving lives, earning some money on the side as a freelance photographer for the Selbridge Sun. 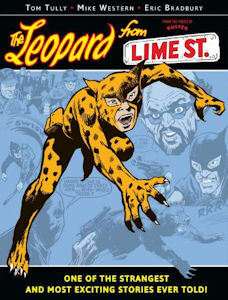 Another highlight from Rebellion's Treasury of British Comics, the Leopard from Lime Street was one of the best British superhero strips ever produced, so it's no wonder it was picked as one of the first series to be collected. I remember drawing a picture of the Leopard in the very same pose seen on this cover (and taken from an early Buster cover appearance) when I was a child - that's how big a fan I was back in the day. Lion King of Picture Story Papers is a massive, 262-page volume covering the story of one of the most popular titles released in the post-Second World War "silver age" of British comics. 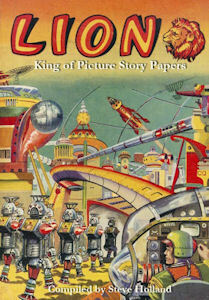 Launched in 1952, Lion was Amalgamated Press's answer to Eagle, featuring its own space hero, Captain Condor on its cover. Every Index compiled by Steve Holland's Bear Alley Books is brilliant and worth picking up if you are at all interested in British comics. I've chosen to focus on the Lion Index here as it's largest index covering the best known comic, but all are worth getting. 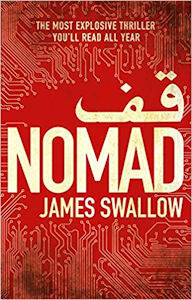 James Swallow has been an established science fiction author for many years, but his first venture into thriller fiction finally got his writing the wider recognition it deserved, putting him on the best seller lists. His second volume, Exile, came out last year, and his next is due later this year. If spy fiction or thrillers in general are your thing, then give Nomad a look. Peter's latest case features a self-driving killer automobile, a Serbian refugee, the Most Haunted Car in England, a handsome drug dealer with a nice paisley scarf and a seemingly harmless wooden bench with a dark past! Supernatural detective fiction in modern day London. 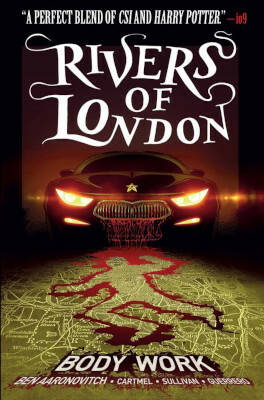 Rivers of London has been a successful novel series for a number of years now, and heartily recommended, but the title to the left is its shift into comics. It's hardly the only amalgam of crime thriller with the supernatural, but it is one of the best. 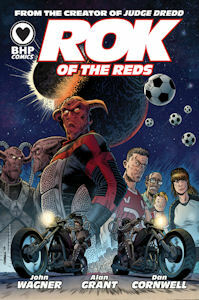 Dangerous intergalactic outlaws and an arrogant footballer collide when Rok of Arkadi, on the run after his home world is destroyed, needs a hiding place. And that hiding place happens to be the life of troubled football star Kyle Dixon. British comics came up with some truly bizarre concepts thanks to the relentless need to think up new stories to fill weekly anthology titles, and football-themed titles were no different. How do you come up with seven strips that all have to feature football players, but all have to be distinct from one another? Well, alongside more mundane ideas such as the soap opera antics of a top player, the struggles of a team threatened by relegation, and the aspirations of skilled young hopefuls trying to rise up the ranks into the professionals, you get teams aided by ghosts (at least four I can think of), teams with bionic players or ones who are secretly robots (at least a couple of these), teams with players who were raised in the wild by animals so they gained incredible skills (hello Kangaroo Kid! ), players who were just raised in harsh wilderness conditions that resulted in them developing superhuman abilities (Hotshot Hamish or Speed's Fastest Footballer on Earth). A much more recent creation by Judge Dredd's founding writers, Rok of the Reds is nevetheless a spiritual descendent of this British weekly comic insanity. I've seen it summed up as Doomlord meets Roy of the Rovers, and it's utterly brilliant. Thruds axe has always done his talking - whether hes stomping a dragon, or accidentally laying waste to an entire town during a battle with his arch-nemesis, The Black Currant. In this first collected volume, Thrud faces down the necromancer To-Me Ku-Pa, protects his beer. 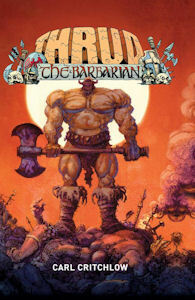 Since his debut in White Dwarf role-playing gaming magazine back in the 1980s I've been a fan of Carl Critchlow's Thrud, a barbarian so dense that spells designed to attack the mind can't find their target. Tougher than Conan, more violent than Rambo, dumber than mud, and very, very funny. 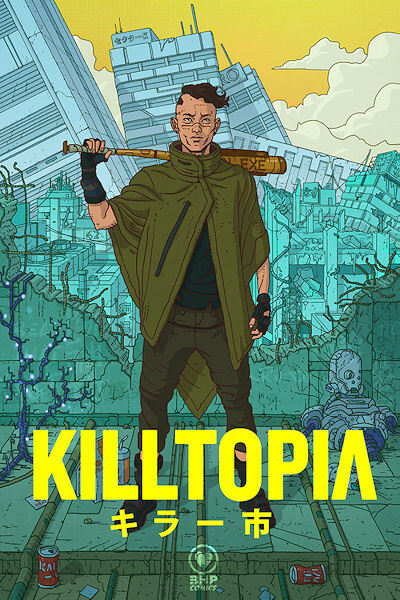 Killtopia is a cyberpunk graphic novel series set in a mega-city in future Japan, where heavily-armed Wreckers are paid to hunt rogue mechs for money, fame and glory. Rookie Wrecker Shinji and Crash, the world's first sentient mech, as they are hunted as fugitives across the neon-soaked metropolis by Wreckers, android killers and Yakuza gangs. Shinji wants to save his sister. Crash wants to be more than a machine. They both want to make it out alive. 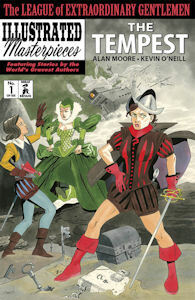 After an epic twenty-year journey through the entirety of human culture, Alan Moore and Kevin O'Neill conclude both their legendary League of Extraordinary Gentlemen and their equally legendary comic-book careers with the series' spectacular fourth and final volume, "The Tempest." This six-issue miniseries is a celebration of everything comics were, are and could be. Opening simultaneously in the panic-stricken headquarters of British Military Intelligence, the fabled Ayesha's lost African city of Kor and the domed citadel of 'We' on the devastated Earth of the year 2996, the dense and yet furiously-paced narrative hurtles like an express locomotive across the fictional globe. This is literally, and literarily, the story to end all stories. Here's how it begins. When Dr Crowe arrives in London to solve the murder of a police constable, he crosses paths with the Elephantman, who is on a mission of his own to find the missing children of Whitechapel. Together they will fight for their lives to survive the night. This new one-shot cross-over is a rip-roaring 1880's pulp adventure, bringing together two iconic indie comic characters: Dr Crowe and Merrick: The Sensational Elephantman. 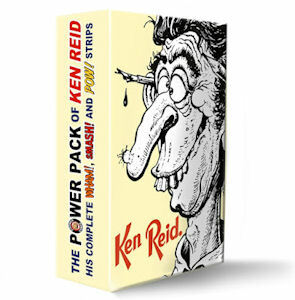 Minimal details so far, but it's been announced (as of May 15th 2018) that a limited edition complete collection of Ken Reid's Power Pack strips is to be released. That's Frankie Stein, Jasper the Grasper, Queen of the Seas, The Nervs and Dare-a-Day Davy. 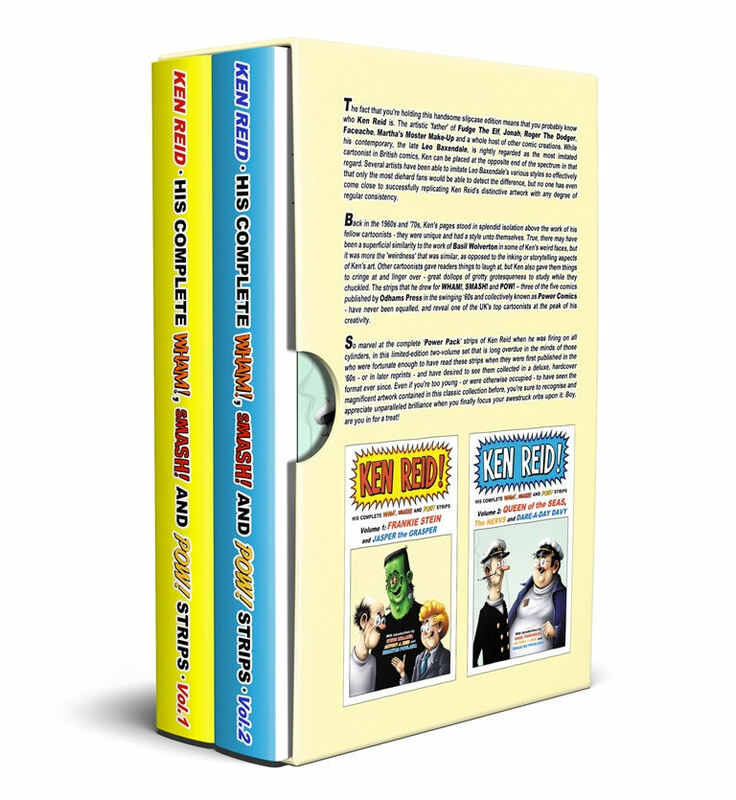 If you know who Ken Reid was, or any of these strips, you'll understand just why this is exciting news. AN EXPRESS ELEVATOR TO HELL  GOING UP! Maxwell Tower is a state-of-the art tower block  a bold, experimental council tenement, run by an A.I. called Max. As building superintendent, Maxs primary function is the welfare of his tenants, which he takes very seriously. And if anyone threatens either the residents or the building itself, they can expect a visit to the Thirteenth Floor  a place where nightmare and reality become one! When the evil forces of Von Hoffman and Dr Mesmer team up and pluck the immortal Adam Eterno from the winds of time, all of reality is under threat! 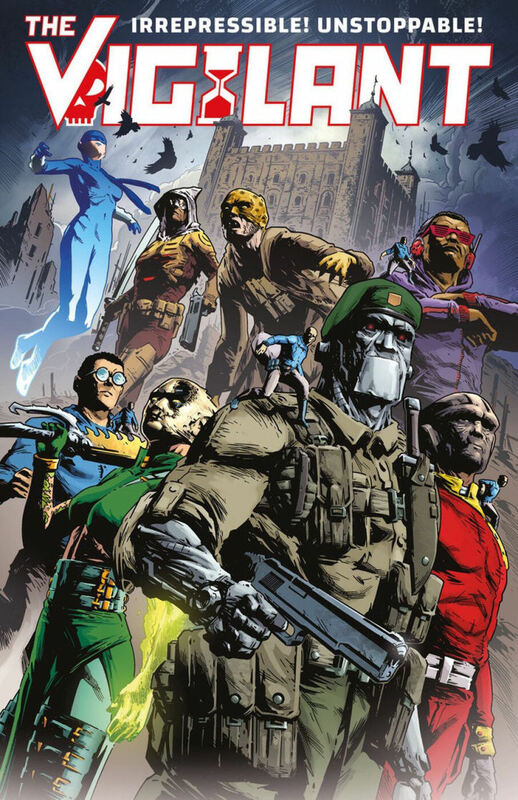 Only The Vigilant; a mighty team composed of super-beings, warlocks, warriors and monsters stand between us and total chaos! Join The Leopard from Lime Street, Steel Commando, Dr. Sin, Petes Pocket Army, Blake Edmonds, Yao and Thunderbolt the Avenger on their premiere adventure. The Rebellion-verse Begins here! Mad scientists, giant monsters, and courageous saboteurs! 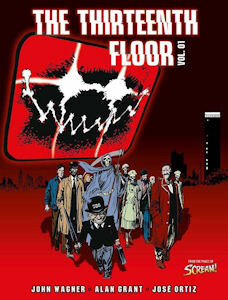 One of the best  and maddest  British cult comics of all time!